Simple but amazing, cod is the best fish but other white fish would work and if you don’t have a deep fryer at home shallow fry in a wok would work just as well. You could add cornichons or capers if you want to jazz it up a bit. I have a thing about soft bread, meaning I love it, so use one of those really soft hot dog buns but toast them well for best results or even pan fry them. Once split, add in a little butter, it works a treat. Make the beer batter by whisking together the self-raising flour, cornflour and beer, making sure there are no lumps. Combine in a bowl the fennel, dill, watercress and preserved lemon dress with olive oil and salt. Cut the bun in half lengthways and toast. Dust the fish in flour then into the beer batter then deep fry until golden and just cooked. 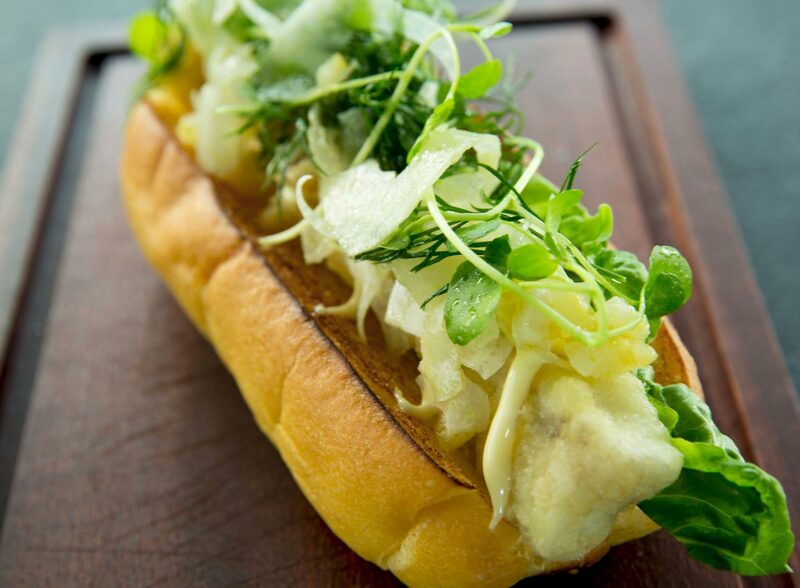 To assemble, spread a little of the lemon mayonnaise on the bun, then cos lettuce, then add the fish. Squeeze over some lemon mayonnaise. Top with fennel and watercress salad.